When Hilma af Klint (1862–1944) began creating radically abstract paintings in 1906, they were like little that had been seen before: bold, colorful, and untethered from recognizable references to the physical world. It was several years before Vasily Kandinsky, Kazimir Malevich, Piet Mondrian, and others would take similar strides to free their own artwork of representational content. 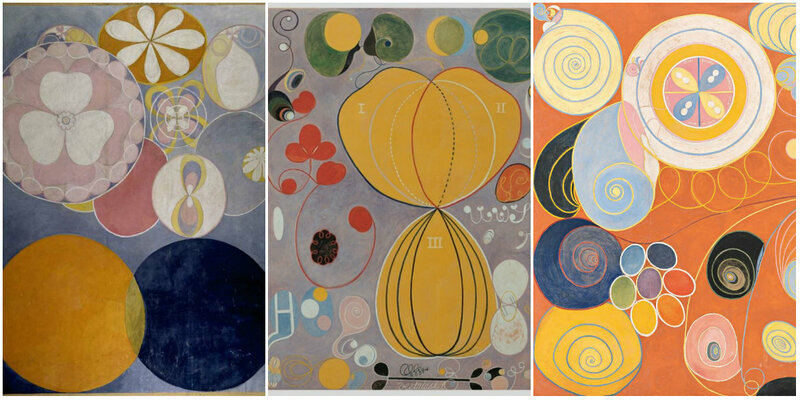 Yet af Klint never exhibited her remarkably forward-looking paintings and, convinced the world was not ready for them, stipulated that they not be shown for 20 years following her death. Ultimately, her work was not exhibited until 1986, and it is only over the past three decades that her paintings and works on paper have received serious attention. Af Klint developed her new approach to art making together with her spiritual practice, outside of Stockholm’s male-dominated art world. She had begun to regularly hold séances with four other women by 1896. During a meeting in 1906, one of the spirits that the group often channeled asked af Klint to create a cycle of paintings. Af Klint immediately accepted. She worked on the project between 1906 and 1915, completing 193 paintings and works on paper collectively called The Paintings for the Temple. These works, which included her first forays into nonobjectivity, were a radical break from the more staid paintings she produced as part of her public practice. Stylistically, they are strikingly diverse, utilizing biomorphic and geometric forms, expansive and intimate scales, and maximalist and reductivist approaches to composition and color. She imagined installing them in a spiral temple, but the building never came to fruition. After she completed The Paintings for the Temple, af Klint continued to test the limits of her new abstract vocabulary. In these years, she experimented with form, theme, and seriality, creating some of her most incisive works. Hilma af Klint – 1906 – Chaos – Nr 2. Hilma af Klint – 1907 – Altarpiece – No 1 – Group X – Altarpieces. Hilma af Klint – 1907 – De Tio Största – no 2 Barnaaldern. Hilma af Klint – 1907 – De tio största – nr 3 Ynglingaåldern Ur Grupp 4. Hilma af Klint – 1907 – The Ten Biggest – No 7.